Hi! My name is Kim Kunze and I am a clinical psychologist in Grand Rapids, MI. If you have never interacted with a psychologist, don’t worry, my hope is to give you a bit of an inside look at what it might look like to work with someone in my profession while (before, during, after) you are going through a gender transition. There are a lot of different terms for people who do the work I do: therapist, counselor, social worker, psychiatrist, gender therapist, shrink and etc. Why should I try therapy? There are a lot of reasons that my clients come to see me (client is the word I use to talk about the people who I treat; some therapists say ‘patients’, some say ‘patrons’). Maybe your doctor told you that you need to see a therapist before you can start to medically transition (starting hormone blockers, hormone replacement therapy, or surgical interventions). Maybe you have a friend who recommended that you go to therapy. Maybe you just want some help with exploring your identity. Some of my clients (many, in fact) are brought in by well-meaning and loving family members, guardians, partners, or friends to ‘make sure’ that the client is really transgender. That is a tough situation for my clients to be in. As a cis-person, I often try to imagine what it would have been like if I needed to prove to my parents that I am a woman. What if I had to work really hard to convince my parents to let me shop the ‘pink aisle’ at the store, or to buy and wear feminine clothing? Then I try to imagine what it would be like to engage in this process over and over again in many other situations with many other people. When a client is brought in by family or guardians in order for the client to address matters related to gender diversity, I often recommend that the family engage in their own therapy so they can learn how to best support their loved one. It is extremely important for a client’s living environment to be safe and affirming. Sometimes, lack of support, rejection, or even violence creates huge problems for my clients. Gender identity is complex, beautiful, and ever-evolving (yes! Even for cis-people!). And not all transitions require an observable change. I recommend doing a bit of research to seek out specific providers. A lot of community LGBTQ centers have lists of providers who are known to be knowledgeable and supportive of LGBTQ needs. When you call the provider, be specific about what you need. For some people, this is intimidating and stressful. It can be a lot easier to make this first call if you know that the provider you are seeking to meet with is transgender/gender nonconforming affirming. The intake coordinator, receptionist, or therapist will ask you for your demographic information. Unfortunately, a lot of billing and medical record programs require that medical providers use the ‘legal’ name of a client. For a lot of TGNC folks, this is their dead-name. You can always tell the intake coordinator your ‘legal’ AND ask that they make a note to refer to you by the name and gender you actually use. The intake coordinator will either schedule an appointment for you, or take your phone number so they can coordinate with the provider you are seeking to see. You will often have some preliminary paperwork to complete at or before your first session, which is usually about an hour long. It does help if you come early or complete the paperwork before your appointment, because an hour may feel like a lot, but it goes quickly. Your therapist will greet you and bring you to their* office. The therapist will ask you questions about why you are there and follow up with questions about your life history. If the therapist asks you something that you don’t want to talk about, tell them that you would rather not address that issue or you want to come back to that later. If I know you are here to see me because of a TGNC-related matter, I usually start out by trying to get a clear picture of whether you need to see me for a letter of recommendation for medical transition, if you have a mental health/emotional/relationship matter you need to resolve, or a combination of both. Some TGNC-affirming therapists have a policy to only write letters for people with whom they have a therapeutic relationship (i.e. they don’t do evaluation-only sessions). It’s important to address this right away so you can quickly move on toward someone who can provide what you need. Speaking of quickness, it is perfectly okay to ask your therapist about the typical duration of the treatment you are seeking. If you are seeking a letter, don’t hesitate to ask the therapist what they need to know about you in order to support your desire to have a medical intervention. Every client is unique, but I usually will have a time range in mind by your second or third session. I always hope that my clients know how much I want to collaborate with them and, if timing is feeling off (too fast or too slow), tell me. I think most therapists feel the same way. There are a couple of mental health conditions that worry medical providers when someone is seeking any type of medical intervention (even bariatric surgeries or organ transplants). It can be frustrating or awkward to feel like you must prove your readiness or to prove your gender identity. Sometimes clients aren’t completely forthcoming during their sessions, because they don’t want to be denied the opportunity to medically transition. I understand the motivation behind this, but, if you have a therapist who is knowledgeable and affirming of TGNC identities, it really will only hurt you to hide important details about yourself. It is especially important to let a therapist know if you are struggling with suicidal ideation, self-harm, hallucinations, substance abuse, or trauma. For some people, going through the medical transition helps to alleviate their mental health symptoms. It’s very important to collaborate with your therapist. I have recommended to some clients that they get a bit stronger in management of a mental health issue before pursuing transition. These are often difficult conversations. However, if you have a therapist who is affirming of and educated about gender diversity, and they are recommending that you wait before transitioning, this is being done with your wellbeing in mind. 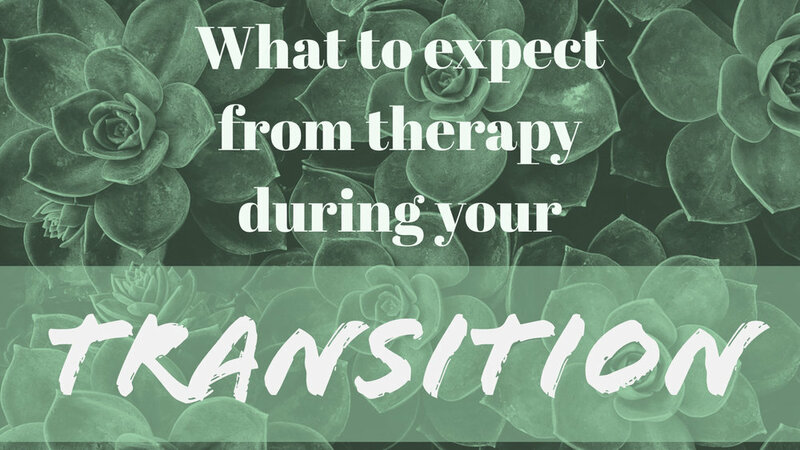 In most cases, your therapist is saying ‘not now’ to your medical transition rather than ‘no’ or ‘never’. It’s important for you to know that I tend to believe that what you say about yourself is true. My job is not to prove that your gender identity is real. Parents often want some assurance on that matter, but you could change your mind each time you come to see me, and I am likely to support you on your journey toward discovering and verbalizing your identity. When I write letters of recommendation for medical gender transition, my job is to give your doctors a bit of information about whether or not you are of sound mind (not hallucinating, not delusional, able to make decisions for yourself or with adequate guardianship support) and able to handle the changes (follow instructions from the doctors, take general care of yourself, handle increases in stress, handle related adjustments). As a side note: having a history of psychosis, suicide attempts, substance abuse, or other mental health concerns should not eliminate you from having access to medical interventions. If something like that is part of your current experience or your past, your therapist is going to explore whether or not your symptoms are reasonably controlled so you can have a successful response to the medical intervention. You may have heard of WPATH, or the World Professional Association for Transgender Health. They are an important organization that works hard to develop standards of care for professionals who assist TGNC persons in their transition or identity development. WPATH currently has Version 7 of its Standards of Care. It can be helpful to look through the WPATH website to get an idea of what is recommended for different providers: www.wpath.org. The purpose of a psychological assessment is for the therapist to be able to have a broad understanding of your history, your readiness for medical treatment, and to come up with a treatment plan to help you meet your goals. WPATH recommends the following factors to be covered by your sessions with a therapist. The therapist should support and empower you and your identity. The therapist often will assess you for ‘symptoms’ of Gender Dysphoria according to the psychological diagnostic manual (the DSM-V). Not all therapists and medical doctors require a diagnosis of Gender Dysphoria because there have been tons of cases in which a TGNC person has not exhibited severe discomfort with their bodies or identities- yet, they may still desire/require a medical intervention. The therapist might need to help you with referrals for other psychiatric, medical and/or surgical needs. The therapist will explore whether there are any other concerns, specifically mental health concerns that might interfere with your ability to engage in treatment. If you have possible concerns, the therapist will help you to figure out how to control those issues so you can proceed with a medical intervention. The therapist will assess whether or not you seem to be able to make reasonable decisions about your own care. Specifically, your therapist may want to know about your childhood development, gender identity, sexual orientation, trauma history, prior mental health treatment, prior hormone treatment, social support, finances, substance abuse history and your understanding of the medical interventions as part of the transition process (if you are seeking a medical intervention). Here are some questions that might help you to get to know your therapist and to know whether or not the therapist can help you. It’s always okay to get a second opinion; especially if your providers do not seem to know much about TGNC identities and medical interventions. How many transgender or gender nonconforming clients have you worked with? How do you support and advocate for your transgender or gender nonconforming clients? Do you write letters of recommendation for medical transition? Are you affiliated with WPATH (the World Professional Association for Transgender Health)? Do you write letters of recommendation for people who do not want therapy? Ask the therapist what they need to do in order to feel comfortable with writing a letter supporting medical gender transition. Ask if the therapist has written such a letter before. Ask the therapist if you can read the letter before they send it to your doctor. * I use ‘their’ instead of ‘him and her’ as a way to be respectful of all gender identities.